Do you have a beautiful baby and harbor sweet dreams of mini-model stardom? If your cutie is destined to go from cradle to coverbabe, but you're not sure what to do and Terry Shields isn't returning calls, you are not alone. Although breaking into the modeling biz might seem daunting, the good news is that legitimate agencies offer a simple, straightforward and inexpensive process. The bad news; there are more adorable little faces than there are gigs. Not all modeling agencies offer children's (ages 0-12) divisions, and those that do are based primarily in major metropolitan cities. Unfortunately for itty-bitty beauties, location does matter, and driving distance can be just as important as dimples. Ford Models, LA Models and Wilhelmina Models are veteran agencies that have been in business for decades and have earned reputations for professionalism over the years. Eileen Ford, co-founder of Ford Models is reported to have said that pretty baby, Brooke Shields, is the reason she opened her kids' division and launched a lucrative career that has lasted a lifetime. For babies looking to follow her lead and turn pro before they can walk, let alone "work" a runway, the first step is to find agencies with children's divisions closest to home. Check out the websites of Ford, LA Models, and Wilhemina's "Willy Kids" divisions online for a complete listing of offices and affiliates. The next step is preparing for the agency's "open call," which is how agents go about the business of finding new faces. Each office has their own process. There is no charge for an open call. Some agencies will ask parents to simply mail 3-5 snapshots for consideration (they will not be returned), while others allow brief, in-person interviews that enable agents to meet baby and see photos at the same time. Open Calls are usually scheduled once or twice a week during specified hours and anyone interested in representation is invited to attend. Personality counts. If baby is having an off day, skip the meet-and-greet and wait for the next call. The most successful baby models are those with easy-going, happy dispositions, who don't mind changing clothes and having pictures taken -- tiny tyrants need not apply. Clean diapers are also a definite plus. In addition, be on time. If you're late for the open call, agents will worry you'll be late for jobs as well. Modeling is a business and professionalism is required no matter how cute you are. Many parents fall for the idea that pricey, professional photos are required to get an agent. Not true. In fact, babies change so quickly, professional pictures become outdated fast. Agents want to see a clear photo of baby's face in a close-up picture from the shoulders up, they will also want to see a few that show the body. Do not provide artfully created scrapbooks of the child from day one. 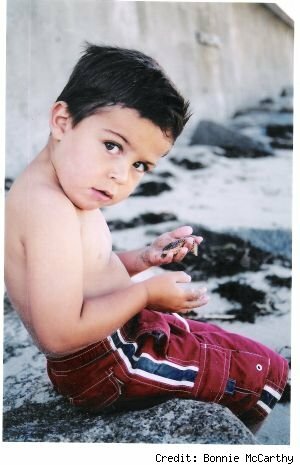 Photos are used to see how baby photographs and to get an idea of how he or she will behave in front of a camera. Dress baby in simple, not overly-fussy clothes. Makeup and elaborate hair-do's are also no-no's. Baby should outshine the clothes and not the other way around. Agents are looking for natural, not manufactured appearances and they are well-trained to recognize the difference. All babies are innately cool, individual creatures; let that shine through. Round up a friend who will act as your "baby wrangler," someone whose sole responsibility is keeping an eye on baby's safety and making sure they are happy. Can you say diva in training? The pros use them during photo shoots to watch over baby's well-being, and it's a good idea for DIY'ers too. In the absence of a wrangler, Wilhelmina suggests putting baby in a safe place such as a stroller (buckled in), or in the center of a swimming tube covered with a blanket. "Give them a rattle, call their name and you've got a winner." Another alternative: lay your baby down horizontal to the camera set up (on the carpet or floor) and call their name, when the baby turns toward you, start clicking. Willykids, the name for Wilhelmina's 0-12 age division, writes on its Web page, "Something that always works with toddlers is to put some adhesive tape on their palms. They will be intrigued that their hands are sticking together and when you call their name -- you've got a great photo." Write the child's name, date of birth and contact information (include your name) on the back of the photos. Agencies will only contact parents if they are interested in "signing" or representing the child. It can take up to six weeks to hear back from an agent. If the call doesn't come, it doesn't mean your baby isn't absolutely beautiful, it probably means they are already representing all the toddlers they need at that time. As in so many things, timing is everything. If an agency would like to represent baby, the work of a parent or guardian has just begun. It is not the agency's job to make sure baby finds paying gigs. They will provide information about when and where "go-sees" for babies fitting your child's description are happening. It is then up to parents to get the child to that "audition" on time with photos. Basically, the same process used in securing an agent is what is done to get hired for jobs. When babies are called to audition for jobs, the people doing the hiring usually have an image in mind of what they want the baby to look and act like. If the client is thinking curly hair and your baby has none, your baby will not get the job that day. The following day, the client may want bald babies, or straight hair. Such is the life of a model, and you'd better get used to it. Modeling is definitely a commitment on behalf of the parent, or whoever will be chauffeuring baby around. Parenting Magazine's photo editor, Miran Hsia says when she's casting a regular cover model she will see 100-120 children in a half day. In an interview on Parenting.com, Hsia said, "I look for big, beautiful eyes, a nicely shaped head, and a great personality. We look for and wish we could find every ethnicity." Hsia says part of her hiring process includes taking a headshot and full body shot of each child using a camera with a flash. "If they don't close their eyes every time I take a shot, I know they're not a blinker!" Hsia describes some of the best model types as, "mini impersonators." "If they're a good mimic, that's great; it means they're responsive, and they'll be able to hold the gestures or poses we ask them to do." Hsia says, "The children that do well like to be held. They enjoy the experience of being photographed. They don't mind having their heads touched, or trying on different clothes or getting their hair done. These kids are resilient." Also, because it's impossible to know what kind of mood a baby might be in on the day of the photo shoot, clients cover their bases by booking several babies for the same job. "When we shoot," says Hsia, "we don't just try one child, because you never know what will happen!" Hsia said 2008's December/January cover model, 10-month-old Eva was a real trooper. "Even though her agency gave her the wrong appointment time, she sat around for four hours and she still managed to smile in every frame." Real moms know that is nothing short of miraculous, and that Eva's mother was a "real trooper" that day as well. Currently, the Live! with Regis & Kelly Beautiful Baby Search 2010 is looking for a baby to appear on the cover of Parenting Magazine and win a grand prize of $125,000 dollars towards a four-year college education. Four runners up will also recieve cash prized to be used toward a college education, and ten semi-finalists will be awarded prizes from Gerber. Act fast, the contest began January 5,2010 and the deadline for entries is January 29, 2010. To enter, click on the link above. Hsia warns however, that just because your child may look like a Gap model with Gerber cheeks, doesn't mean their destiny lies in front of a camera. "A typical photo shoot can last up to two hours; between teething, stranger anxiety and missed nap schedules, even the experienced kids can dissolve into meltdowns ... Think about it -- if your child doesn't like being stared at by a literal wall of unfamiliar adults, sitting still or changing in and out of clothes all day, baby modeling may not be right for her." She also wants parents to consider if the opportunity is right for them. "What parents don't realize is how much hard work it is for them," says Hsia, "Having a child model becomes a full-time job."